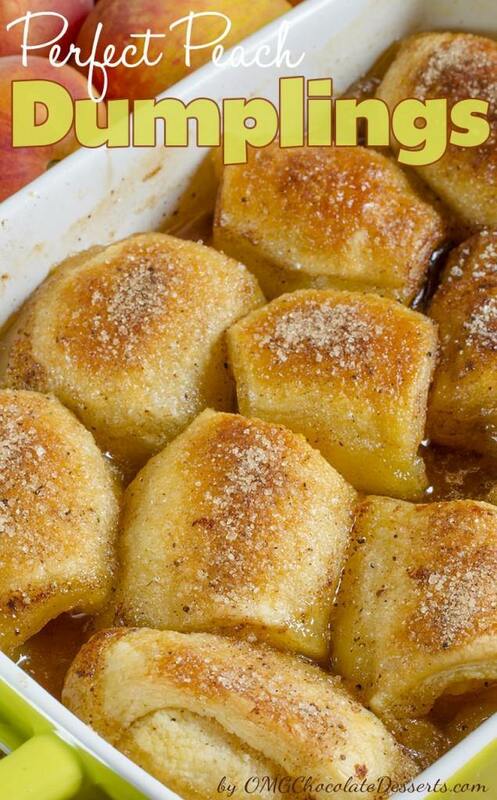 This Crescent Roll Peach Dumplings recipe is one of the best Southern food dessert recipes. Another recipe without chocolate! Really distressing, but in a temperature of over 30 degrees, what do you have left except fruit? Well, all right, why not! So many beautiful fruit treats can be prepared, but things can get complicated when you have a restriction of using berries in the middle of the season. What kind of restriction, you must be asking yourself now? „Look at your blogs through the last few weeks and you will see that there is nothing except treats with berries. I think it’s time for you to forget about berries, at least for two or three weeks!“, was the answer of my husband, when I asked him what he thought about a beautiful strawberries cake for my new project. Hmmm, true! Of the last seven posts on my blog, six recipes were with strawberries, blueberries or raspberries. Maybe I got a little carried away. This time, I decided to make something that my husband really loves without berry. And immediately, I remembered a recipe which, of all my treats, delighted my husband the most – Apple Dumplings. When I remember that after the dumplings, in all his eating enjoyment, Darko kissed me on the cheek, then it was completely clear that this was my final solution. But, of course, I had to make a change. Instead of apples, this time it will be Peach Dumplings since my kitchen was full of fresh peaches. Of course, I would never repeat an older recipe, so my Peach Dumplings had to endure some changes. First, the shape won’t be like crescent rolls, but a little different. Second, instead of the 7up soda, this time I will use Fanta. And that is that. And so, after about 30 minutes, on the tables were Peach Dumplings and the smell which was spreading immediately attracted my husband! „Wooow, Dumplings! Vera, you are the queen“. He was delighted and just couldn’t wait for the dumplings to cool off. „Well, this is great. But…these aren’t apples!“ concluded my gourmand! „Never mind, it looks to me like they are more tasty then the last ones“ concluded Darko literally drowning in the dumplings. „And do you remember what you did the first time you tried them?“ I was joking around with Darko. „Well of course I do“ answered my husband and kissed me first on one and then on the other cheek, so I had peach all over my face (it was probably intentional ). „It’s not my fault that you are the master of dumplings“, he was laughing while I was whipping my cheeks. 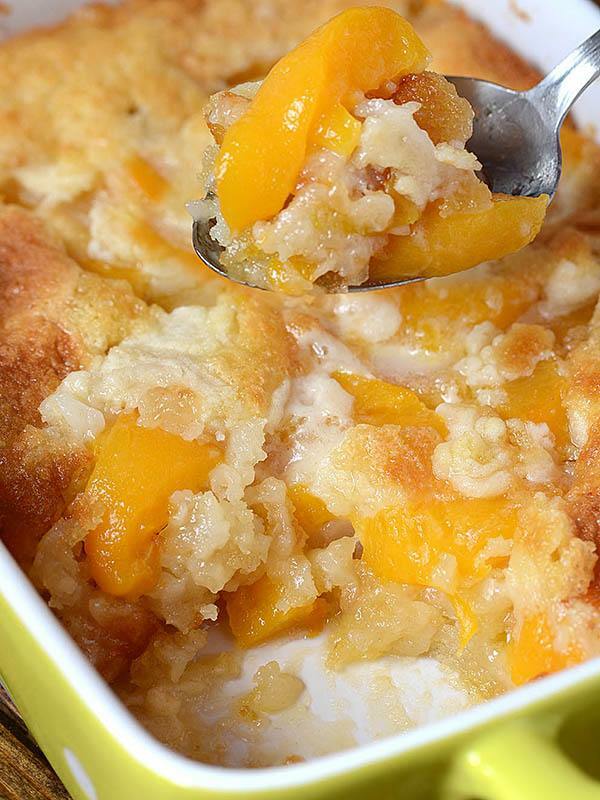 There are three reasons why this fantastic Peach Cobbler can become one of your favorite recipes – it’s super tasty, super simple and super economic. You don’t believe me? Try it and tell me if I was right! 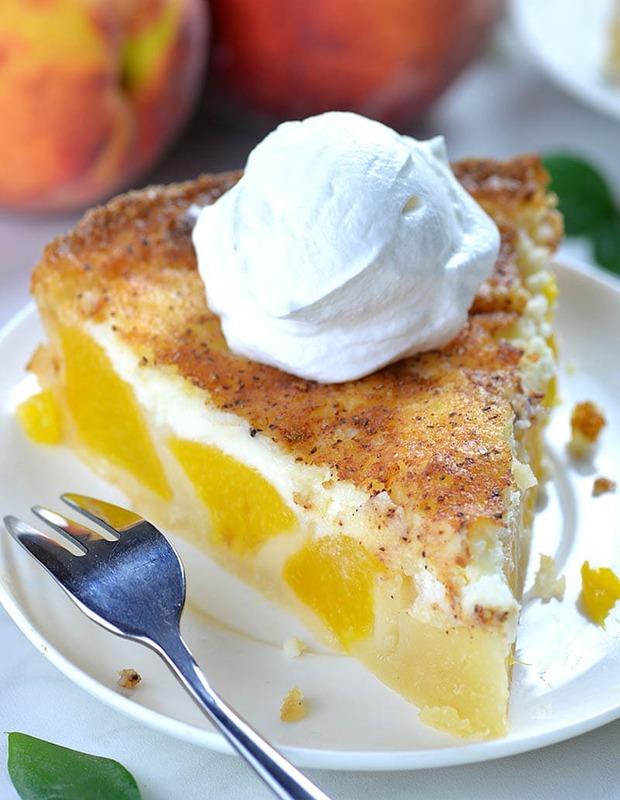 Peaches and Cream Pie is delicious, refreshing summertime dessert. This easy recipe calls for canned peaches, so you can enjoy it any time of year. 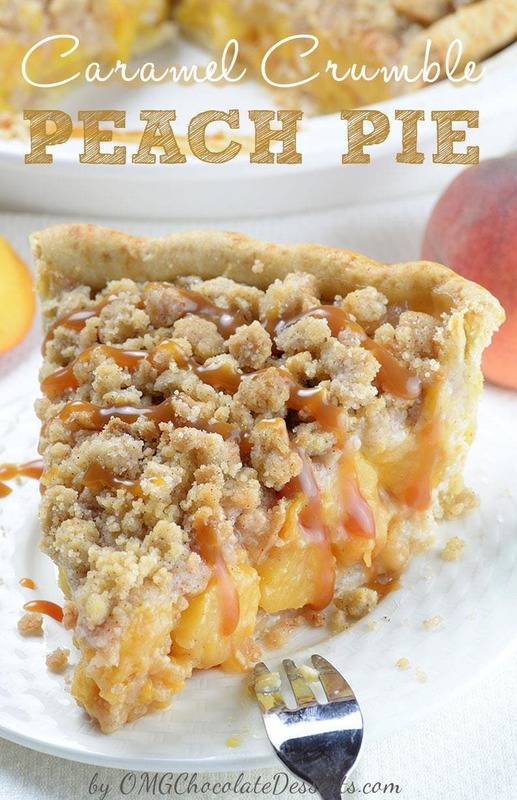 Caramel Crumble Peach Pie – homemade buttery crust packed with sweet juicy peaches and salted caramel sauce, topped with brown sugar cinnamon crumbs. Super easy, crowd-pleaser summer dessert. 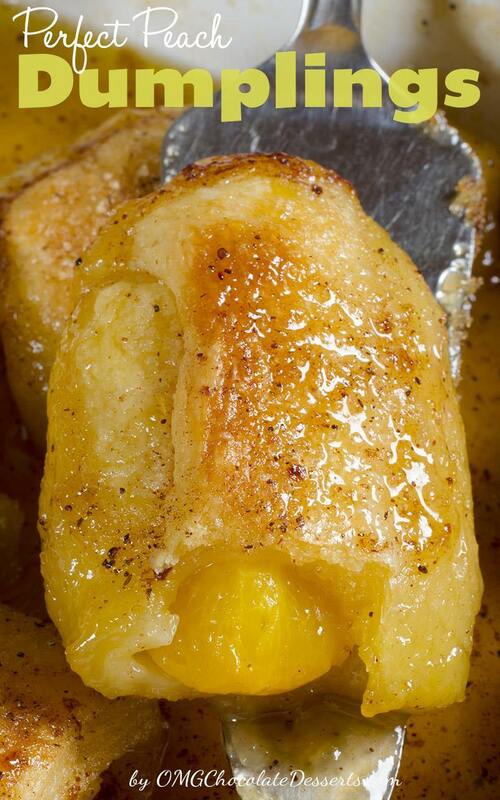 This Crescent Roll Peach Dumplings recipe is one of the Southern food dessert recipes. Butter 8×8 inch baking dish. Roll each peach slice in a crescent roll and place in a buttered dish. Melt butter, stir in brown sugar, cinnamon, lemon juice and vanilla, when it’s thickened, remove from heat and pour over the dumplings. Bake for 30-40 minutes, or until they become golden brown. 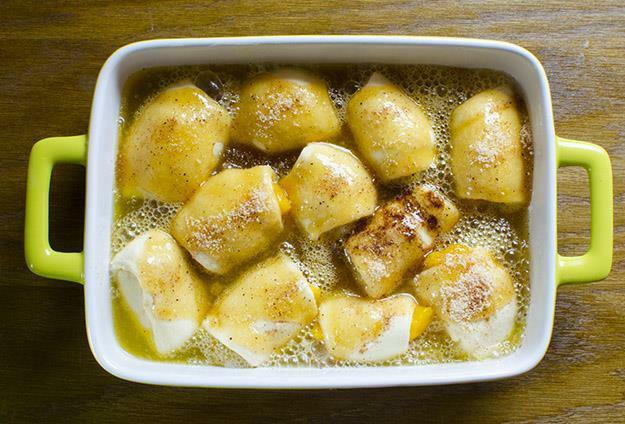 You can sprinkle more cinnamon-sugar on top of the baked dumplings if you like. Made this last night with blueberries. Only thing I did different was add a teaspoon of lemon juice. EXTRAORDINARY!!!! Can’t wait to make it with peaches. Thanks for a fabulous recipe. The dumplings look delicious and I’m eager to make them! One problem, though – in my country there is no frozen dough in supermarkets. Do you have a recipe for the roll dough? Looking forward to many more mouthwatering recipes! Hi Monica, you can find many recipes for puff pastry dough on the internet if you can’t buy it frozen in the supermarket. Why did you whip your face? These look great…I can smell them already! Do you have to use a can of soda? Can u completely omit it, and the recipe still work? You do NOT have to use sugary soda to make a similar recipe to these – this recipe is a straight copy from the Pillsbury site, lol. Anyway, just do a Google search for “peach dumplings crescent rolls” and several recipes using pure ingredients instead of disgusting, unhealthy soda are readily available!! Hope that helps!! Thanks! We gave up HFCS and corn sugars when we discovered that my kids were allergic to corn, and I can’t do nutrasweet (migraine trigger) so I was debating what to sub for the soda. I have done these with apples. I too gave up sugary sodas. I used club soda (no sugars, no sodium, 0 callories. ) It worked fine and there is plenty of other sugar in the recipe. I am wondering if I could use canned peaches? Hi Carla, I didn’t try it but I think you coud use canned peaches. If you have Sierra Mist citrus drink available, use that it should be in soda/ pop aisle. It doesn’t have any HFCS or caffeine, but does use real sugar, No atificial ingredients. I used canned peaches and reserved the juice. The only changes I made in the recipe were canned peaches instead of fresh and the reserved juice instead of the pop. It was excellent. Hi! If you want to tweak this, omitting the soda makes a thick glaze instead of a syrup. If you don’t have soda on hand, dump a can of peaches plus 2 tbls of brown sugar, cinnamon, and 2 or 3 tbls of butter in the pan. Give it a quick stir. Place the crescent rolls on top, sprinkle with a bit of brown and white sugar and cinnamon, and bake 350° f for about 15 minutes. Im not trying to step on toes for the dumpling recipe, im just usually living on pennies and very little time and resources. Besides, you can’t be a great cook without feedback right?! I made these this morning exactly as the recipe directed, and they were delicious!!!! I will be making these again very soon!!! I made the peach dumplings today. I’m not a “pretty” food cook; I think it’s a time thing, so my dumplings were a bit disfigured (and my peach slices were more like chunks). But man these are delicious!! I had a lot of very-ripe peaches so I made a double batch in 3 dishes; one to give to my friend who gave me all those peaches, one to eat & share part of with a neighbor, and one that I’m perplexed over what to do — freeze it? Put in fridge? I’d LOVE to freeze it and heat it in the oven at a later date (this would be mainly to keep me from eating the whole thing while my hubby is gone this next week). So — can this be frozen (already baked) and reheated later? Or will it be too soggy? Thanks Becky, I’m glad that everybody like the dumplings. I’ve never tried to freez them so I can’t help you about that. 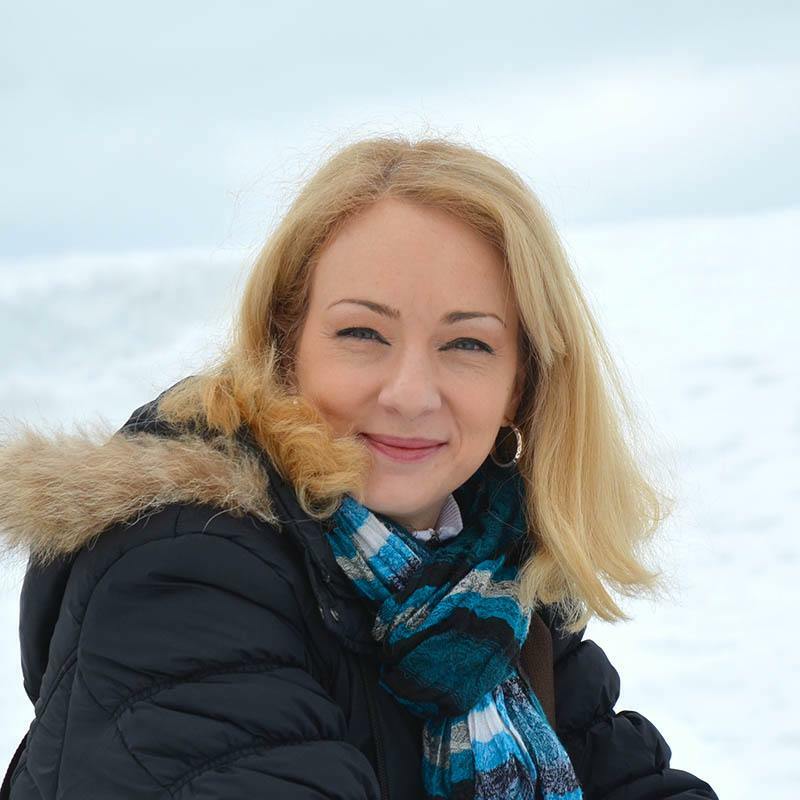 Poštovana ms Vera, ovaj recept mi se jako sviđa i mislim da bi svi moji ukućani ga rado jeli, ali me zbunjuje vrsta tjesta. Kod nas nema gotovih tjesta osim lisnatog tjesta. Koje tjesto da sama napravim – prhko tjesto, tjesto s germom ko za gibanicu ili lisnato tjesto s germom ko za kroasane ili neko drugo!!!! Postovana gospodjo Dragice, mozete koristiti kupovno lisnato testo. Can you use canned peaches. I have several cans would like to try this. Hi Brandy,I use fresh peaches but I think you could use canned as well. I have frozen peaches and ginger ale on hand, giving this a go tonight! Can you make these the night before and re-heat before serving? We go to a friend’s house every Wednesday and I wouldn’t have time to get home from work and make them before we leave. Hi Janis,I didn’t try to re-heat them but I think it will work, too. I have made this with Granny Smith apples and 7 up. It is almost as good at room temp. These turned out great 🙂 I know my kids will love them when they get home. Thanks for sharing the recipe. I’m making these this morning for a birthday at work. My kitchen is smelling WONDERFUL. I wrapped my peaches last night and put them in the ‘frig and that seemed to work. Is it time to eat yet? I used pie crust and substituted Peach Fresca! They were a Labor Day Breakfast hit! Did you bake the dumplings at all before you put the soda on them? I’ve made chicken & cheese dumplings before, the top was cooked but the bottom was doughy. I do this with apples except I blend 2 C granulated sugar with ! stick room temp butter, vanilla and cinnamon and pile it on top of each dumpling and 1 12 oz can of mountain dew. As you can tell my wife and I are not on a diet!!! Lol. Gonna try the peaches next time! I have made this apples instead orange soda we use mountain dew an when its done either serve with vanilla ice cream or cool whip it is so delish I would recommend this to anyone to try with any fruit you like …. I made these today for Thanksgiving. They were amazing! I used canned peaches instead of fresh and my brother and I decided to add some makers mark bourbon. I got compliments all day long. I made these, omitted the soda and substituted peach juice from can and 1 cup of mango juice mixed in with the sugar and butter mixture. It came out delicious, I couldn’t stop going back for more! I used can peaches in 100% juice not syrup instead of fresh peaches also. Prepared this using 2 cans of rolls and frozen peaches. Did not alter the rest of the recipe at all. It was a spectacular hit! Everyone loved it! These were great. I had ginger ale on hand so that is what I used. Yummy! Hi! I came here from Pinterest because I was curious about what was a dumpling…But I followed the link because yours looked heavenly. I’d love to try them, but I’m not sure if the recipe for croissants I have will be the same as of those rolls you use. This is the hardest part of finding a recipe around here: trying to adapt it to local products. I’d like a brief description about the dough you use here, Its texture specially, so I can find the right homemade substitute for it. Thanks, and I guess I’ll be steping by whenever I can ( Because I love chocolate). for those in other countries who are having trouble finding the crescent dough you can use a pie crust homemade or store bought and it will work. I have all of the ingrediants except the orange soda. Can I use 7UP or Sprite? Can I substitute the orange soda with 7UP or Sprit? I live in Spain so we have a glut of peaches, but no cans crescent rolls, (whatever they are), could you suggest an alternative please? Hi Sandy, you can use puff pastry if you can find it there, just roll it out and cut into triangles. I’m headed to the farmers market tomorrow and peaches will be bought and this recipe will be made! Thanks so much for sharing! This looks great and I’m planning to make these tomorrow night for friends. How much butter is a stick of butter? Thanks for the recipe! Hi Miss B, it’s 4 oz. or 113,5 grams. The receipe calls for an 8×8 dish. The picture looks larger. Hi Tim, it’s not larger, it maybe look that way because the shape of my baking dish isn’t square, but it has the volume as 8×8 inch dish. Can I replace the soda with a juice because I don’t drink fuzzy drinks !?? Hi Hind, I always make this with soda, so I can’t tell how it would work with juice. Has anyone tried to make ahead and then reheat. Why do you use the soda? Hi Susan, you can use lemon soda if you don’t like orange. I’ve never baked with sodas such as 7-up or orange soda. What’s it’s purpose? How does it work & in what way does your peach dumpling with soda taste different that peach dumplings without soda? Love most fruit, but peaches …. not so much. Can I make this with pears? Hi Janet, you could try it. These look so yummy and easy to make! Can’t wait to try! Thank you for sharing! Thank you for sharing this? Your recipes take SO LONG to print due to all the pop ups and ads. Then it prints on three pages because there are large ads in the middle. Just not worth it. What does orange soda do? What would be a good substitute? A pastry or sweet bread dough ? I’d make the dough from scratch of course, so am keen to try with my own preserved peaches as we’re in winter..
oh, and pleased they’re not “yet another berry recipe” as I’m allergic so thank you. Can these be frozen and served later? Cooked these for my son and family (3 boys) and it will be a keeper÷ Thanks, love cooking for our families. Thanks Lois 🙂 I hope your coworkers like it,too. I will make mine with Apple Cider. I had thIs dessert for dinner today and OMG, it was awesome. Thank you for sharing! I’d never made his type of fruit dessert dumpling before but I’d always wanted to try. This recipe turned out wonderfully! The crescent dough cooked up wonderfully, crispy on top and soft on the bottom, and after the long cook time even the hard, underripe peaches I used were perfectly soft. I daresay they were even better in the days after I made them and reheated them in the microwave! My only negative is that the flavor of the soda (especially that artificial/chemical taste) came through much more than I was expecting and I think that it brought the sweetness level to an almost sickly sweet level in some ways. I will definitely remake these but next time I think I’ll add some lemon Spindrift seltzer in place of the soda to get that perfect taste. Great recipe, thanks for posting! !